This summer I decided to plant a garden. I’ve lived in my house for almost fifteen years and never attempted to grow my own veggies. Probably because I have not so great memories of the labor I did in the family garden growing up–moving rocks, picking beans, squash, maters, corn, okra, cucumbers, snapping beans and snapping beans and did I mention snapping beans? But, nonetheless, I decided to give it a shot this year. My original list of plants included tomatoes, green beans, cucumbers, squash, egg plant, and corn. (I know this because it’s still on the white board beside the front door.) 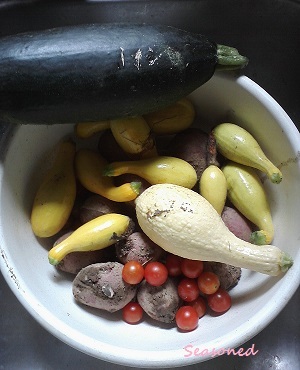 I never got the egg plant or the corn, but I hiked up the hill to my school’s green house and got the rest plus some jalepeno pepper plants (with visions of salsa in my head) and hurried home to start gardening–knowing next to nothing about it. My next door neighbor Mr. C, who is in his seventies, gardens all year long. Twelve months there’s something growing in his yard that will turn into something yummy in a pot or pan. He congratulated me on my raised beds (compliments of my brother), and I eagerly awaited veggies. There have been some successes. I have great luck with what I call “tiny tomatoes” (because it’s more fun to say than cherry tomatoes). They’re really yummy in scrambled eggs with some Mexican style four cheese. 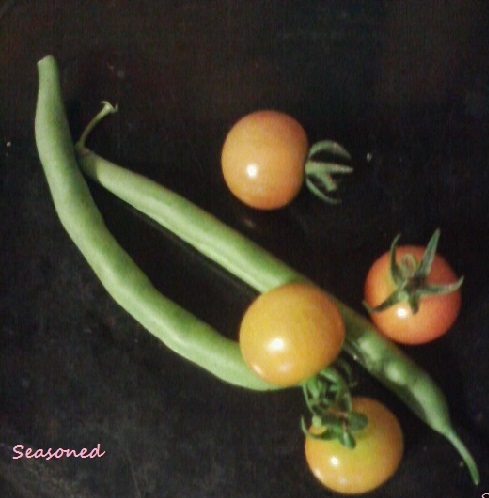 My first harvest was four tiny tomatoes and two green beans. And those are my successes. Tiny tomatoes and two green beans. I’ve not gotten any more green beans. My peppers? They drowned. And my cucumbers–well, they turned out to be squash. I think I’ll just keep being grateful for the gracious gifts of Mr. C’s expertise–which includes potatoes and cabbage and zucchini and collards and . . .
I’m uber-impressed, even with your “small” successes (I can’t keep one single thing alive…and that’s inside!). And your egg scramble is making my mouth water! Today I added some fresh basil! Good stuff.